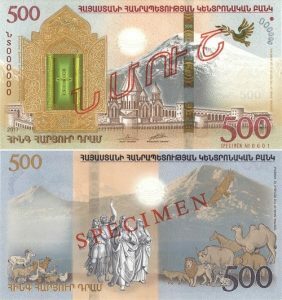 YEREVAN, November 22 2017: Armenia’s Central Bank has unveiled a new hybrid banknote “Noah’s Ark” with a face value of 500 drams. The size of the banknote is 140 x 76 mm. It is printed on high-quality Hybrid ™ composite material, covered on both sides with cotton paper and protected by a thin layer of polyester. The obverse of the banknote features images of Reliquary with a fragment of Noah’s Ark and Monastery of Etchmiadzin, on the background – the Mount Ararat. The reverse features images of Noah and his family with animals and birds around them, on the background – the Mount Ararat. The banknote has a multi-colored Noyan Tapan (Noah’s Ark) watermark, as well as a face value watermark. According to Central Bank secretary general David Nahapetyan, the 500-dram collectible banknotes are a prototype of new third generation composite banknotes, which will go into circulation on November 22, 2018, when Armenia will mark the 25th anniversary of introduction of the national currency. The collectible banknote is in circulation since November 22, 2017. “Noah’s Ark” banknotes can be obtained at the Central Bank’s “Dramaget” Museum for 1,700 drams. The bank has issued 300,000 such banknotes.